Allahabad (Hindi: इलाहाबाद; Urdu: الہ آباد Ilāhābād) is the English name of a city in the north Indian state of Uttar Pradesh. The name is derived from the one given to the city by the Mughal Emperor Akbar, in 1583. In Indian languages, or in India generally, the name is Ilāhābād, with ilāh being Arabic for "(a) god" (in this context, from Din-i-Ilahi, the religion founded by Akbar), and "-ābād" being Persian for "place of." The ancient name of the city is Prayāga (Sanskrit for "place of sacrifice," Prayāg in modern Hindi) and is believed to be the spot where Brahma offered his first sacrifice after creating the world. It is one of four sites of the Kumbh Mela (Hindu pilgrimage sites), the others being Haridwar, Ujjain, and Nasik. The city has a strong position of importance in the Hindu religion and mythology, since it is situated at the confluence of the holy rivers Ganga and Yamuna, as well as the the invisible Sarasvati River which is believe to join the other two according to Hindu beliefs. The city encompasses a large area and is an inland peninsula surrounded by the rivers Ganga and Yamuna from three sides with only one side connected to the mainland. For this reason, and because of the immense traffic it receives, Allahabad is also famous for its large number of grand and magnificent bridges. Along with all of these things, the city is famous for producing a number of prime ministers of India in some form or another. Jawaharlal Nehru, Lal Bahadur Shastri, Indira Gandhi, Rajiv Gandhi, Gulzari Lal Nanda, Vishwanath Pratap Singh, and Chandrashekhar were all either born in Allahabad, alumni of Allahabad University or elected by a constituency from Allahabad. Through these connections, Allahabad has produced 7 out of the 14 historical Prime Ministers of India. Allahabad city is made up of a number of large areas, but it also has several satellite cities that are located on the other side of the rivers Ganga and Yamuna. In addition to these, there are also a large number of townships and villages near the city of Allahabad within Allahabad District. Since solar events in Allahabad occur 5 hours and 27.4 minutes ahead of Greenwich, the city is very close to the reference point for IST or Indian Standard Time which is + 5 hours and 30 minutes ahead of Greenwich. Allahabad is -2.6 minutes behind IST and Varanasi is +2 minutes ahead of IST. Actual IST longitude is between these two cities. Allahabad has a rich and varied history, which is deeply embedded in various areas throughout the city. The ruins of Kaushambi, which was once the capital of the Vatsa kingdom and later a thriving center of Buddhism, is located towards the southwest of the city, on the banks of the Yamuna River, and provides an interesting insight into a long forgotten era. On the eastern side, across the Ganges River and connected to the city by the Shastri Bridge is Jhunsi, which is identified with the ancient city of Pratisthanpur, the old capital of the Chandra Dynasty. About 58 kilometers northwest of this location is the medieval site of Kara, with its impressive wreckage of Jayachand's fort. Sringverpur, another ancient site discovered relatively recently, has become a major attraction for tourists and antiquarians alike. The Puranas record that Yayati left Allahabad and conquered the region of Saptha Sindhu. His five sons Yadu, Druhyu, Puru, Anu, and Turvashu became the main tribes of the Rig Veda. When the Aryans first settled in what they termed the Aryavarta, or Madhyadesha, Allahabad was an important part of their territory. The Vatsa (a branch of the early Indo-Aryans) were rulers of Hastinapur (near present day Delhi), and they established the town of Kaushambi near present day Allahabad. They shifted their capital to Kaushambi when Hastinapur was destroyed by floods. In the times of the Ramayana, Allahabad was made up of a few rishis' huts at the confluence of the sacred rivers, and most of what is known in India as the "vats" countryside was made up of jungles. Lord Rama, the main protagonist in the Ramayana, spent some time here, at the Ashram of Sage Bharadwaj, before proceeding to nearby Chitrakoot. The Doaba region, including the city of Allahabad, was controlled by several empires and dynasties throughout Indian history. It initially became a part of the Mauryan and Gupta empires of the east and the Kushan empire of the west, before becoming part of the local Kannauj empire which became very powerful in northern India. Objects unearthed in the city indicate that it was part of the Kushana empire in the first century C.E. In his memoirs on India, Huien Tsang, the Chinese chronicler who traveled through India during Harshavardhana's reign (607-647), wrote that he visited the city of Prayag (or Allahabad) in the year 643. When Muslim rulers arrived in India, the city was annexed by Mhd Ghori in 1193, and became a part of the Delhi Sultanate. The Mughals eventually took over control of the region from the rulers of Delhi and under their rise, the city once again rose to prominence. Acknowledging the strategic position of the city in the "Hindustan" region at the confluence of its defining rivers, with immense navigational potential, the Mughal emperor Akbar built a magnificent fort on the banks of the holy Sangam, and re-christened the town as Illahabad (or Allahabad) in 1575. The Akbar fort is made up of an Ashokan pillar and a number of temples, but at the time was largely a military barracks. On the southwestern extremity of Allahabad lies Khusrobagh, which houses three mausoleums, including that of Jehangir's first wife, Shah Begum. It was initially from Allahabad that Prince Salim, later to become emperor Jehangir, revolted against his father, the Mughal emperor Akbar. In 1602, prince Salim held a parallel imperial court in Akbar's fort, ignoring the royal summons to leave Allahabad and proceed to Agra. While there was a high degree of familial struggle between the two, before his death in 1605, Akbar did name Salim his successor, and he eventually became known as Jehangir. Before colonial rule was imposed over Allahabad by the British, the city was rocked by Maratha incursions. This strong influence has been commemorated through the presence of two beautiful eighteenth century temples with intricate architecture. In 1765, the combined forces of the Nawab of Awadh and the Mughal emperor, Shah Alam II, lost the Battle of Buxar to the British. Although the British did not take over control of the states immediately, they did establish a garrison at the Prayag fort, clearly realizing the city's strategic position as the gateway to the north west of India. Governor General Warren Hastings later seized Allahabad from Shah Alam II and gave it to Awadh, alleging that he had placed himself in the power of the Marathas. In 1801, the Nawab of Awadh ceded the city to the British East India Company. Gradually, the other parts of Doaba and the adjoining region to the west (including Delhi and Ajmer-Mewara regions) were also won over by the British. Eventually, these north western areas were made into a new Presidency called the "North Western Province of Agra," with its capital at Agra. Allahabad remained an important part of this state. In 1834, Allahabad became the seat of the Government of the Agra Province and a High Court was established. However, a year later, both were relocated to Agra. In 1857, Allahabad was active in the Indian Mutiny. After the mutiny, the British truncated the Delhi region of the state, merging it with Punjab and transferring the capital status of the North west Provinces to Allahabad, which remained so for the next 20 years. 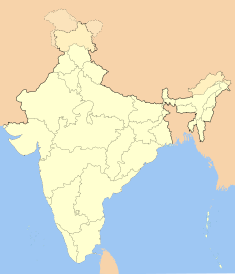 In 1877, the provinces of Agra (NWPA) and Awadh were merged to form a new state which was called the United Provinces. Allahabad was the capital of this new state until the 1920s. Well known for its reputation in producing Indian political leaders, it is not surprising that Allahabad played a significant role in the Indian independence movement in the first half of the twentieth century. Several meetings by pro-independent groups such as the Indian National Congress and the Muslim League were held in the city, and in fact, the very idea of an independent Muslim state (Pakistan) was first suggested in the city, during a presidential address by Muhammed Iqbal on December 29, 1930. Allahabad is located in southern Uttar Pradesh, at 25°28′N 81°50′E, and stands at the confluence of the Ganges and Yamuna rivers. The region was known in antiquity as the vats country. To its south west is the Bundelkhand region, to its east and south east is the Baghelkhand region, to its west is the Doab region, and the Awadh lies to its north and north east. Allahabad stands at a strategic point both geographically and culturally. As an important part of the Ganga-Yamuna Doaba region, it is the last point of the Yamuna River and the last frontier of the Indian west. The land area of Allahabad district falls between the Ganges and Yamuna and is just like the rest of the Doab, fertile but not too moist, which is especially suitable for the cultivation of wheat. The non-Doabi parts of the district (which were not originally a part of Allahabad but were added later by the British) such as the southern and eastern parts are somewhat similar to those of the adjoining Bundelkhand and Baghelkhand regions, with dry and rocky terrain. Allahabad has renowned institutes, colleges, and universities that are famous not only in India but also abroad. It is major center of learning for students coming from all over the world to seek knowledge from the prestigious University of Allahabad. The city is also home to Allahabad Agricultural Institute-Deemed University, which is the oldest such institute in South Asia. It has produced a number of scientists, agricultural engineers and professionals working both in India and abroad. Allahabad holds a unique status as one of the major pilgrimage sites for Hindus all over India. The Kumbha mela pilgrimage is held here every 12 years, and it draws about 15 million people, making it the largest attended event in the world. In order to prepare for such a large migration of tourists/pilgrims into the area, a temporary city is created in Allahabad every time the festival is held. During the festival, there are several especially auspicious bathing days, when pilgrims will wade into the Ganges River, and bathe in it, in order to receive its spiritual blessing. The Kumbha mela is a spiritual gathering for Hindus, where yogis, sadhus (saints), holy people, and pilgrims gather from all over India. Many sadhus come from various holy places, including the most remote forests and mountain caves in the Himalayas. On the most auspicious bathing days, the worshipers hold a large parade, and the bathing order is very strictly observed. Not only are there especially auspicious days, but there are especially auspicious times of the day to bathe, and people are willing to die to bathe at the most auspicious times. The first individuals who are given entry to the water are the most important sadhus and yogis, and after that each different religious group enters the water in a prearranged order. Along with the Kumbha mela, every six years there is also an Ardha mela (half mela), which draws about seven million people, and every year there is a regular Mela during the month of Magha on the Indian calendar, which is between January and February, drawing about one or two million people. 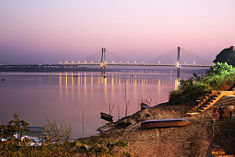 As a major center for pilgrimage among the majority Hindu population of India, the city of Allahabad is well connected by various means of transportation. The city is served by the Bamrauli Air Force Base (IXD) and is linked to Delhi and Kolkata (Calcutta) by jet lite and Air India regional, and to Khajuraho and Agra by other airlines. Other airports in the vicinity are Varanasi (147 km) and Lucknow (210 km). National Highway #2 runs through the center of the city, and Allahabad is located in between Delhi and Kolkata on this highway. Another highway that links Allahabad is National Highway #27, which is 93 km long and starts at Allahabad, ending at Mangawan in Madhya Pradesh. There are a number of other highways that link Allahabad to other parts of the country, and Allahabad also has three bus stations catering to different routes. Tourist taxis, auto-rickshaws, and tempos are available for local transport. There is also a local bus service that connects various parts of the city. However, the most convenient method of local transport is the cycle rickshaw. Rates for these methods of transportation are not fixed and can be bargained with the various drivers in the area. In addition to the above, the city is also served by the Indian Railway. Allahabad is the headquarters of the North Central Railways Zone, and is well connected by trains with all major cities in the country, including Kolkata (Calcutta), Delhi, Mumbai (Bombay), Chennai (Madras), Hyderabad, Lucknow, and Jaipur. Allahabad has four railway stations: Prayag Station, City Station (Rambagh), Daraganj Station and Allahabad Junction (the main station), which provide service to a variety of destinations. Benazzo, Maurizio, Nick Day, Krishnanand, Justin Davis, and Jasper Johal. Short Cut to Nirvana Kumbha Melā. New York: Zeitgeist Films, 2005. Thompson, Edward John and Geoffrey Theodore Garratt. Rise and Fulfillment of British Rule in India. Allahabad: Central Book Depot, 1962. This page was last modified on 5 March 2019, at 23:38.